The goofy footer topples 3 past Champs in 8-12′ Sunset! SUNSET BEACH, HAWAII – (Nov. 9, 2014) — Sweet poetic justice was delivered at Sunset Beach today as Kauai’s Danny Fuller won the first event of his 15-year career at the HIC PRO and qualified for the prestigious Vans Triple Crown of Surfing that begins Wednesday, at Haleiwa. It all went down in triple-overhead surf at a venue famous for being unforgiving, but Fuller, 32, was committed and sharp on his backhand, posting a clear-cut victory in the four-man Final. Above: Danny Fuller (center), taking in a surreal moment. Established Samsung Galaxy ASP World Championship Tour competitor Fred Patacchia finished runner-up today; third was defending HIC PRO champion Mason Ho – whose result today saw him clinch the ASP Hawaii Regional Champion title; and fourth was Maui’s Billy Kemper. Fuller has long been respected as one of Hawaii’s most talented chargers and versatile surfers in everything from giant surf to dredging barrels. He has made several finals at Pipeline and Sunset over the years, but never tasted victory. That all changed today. 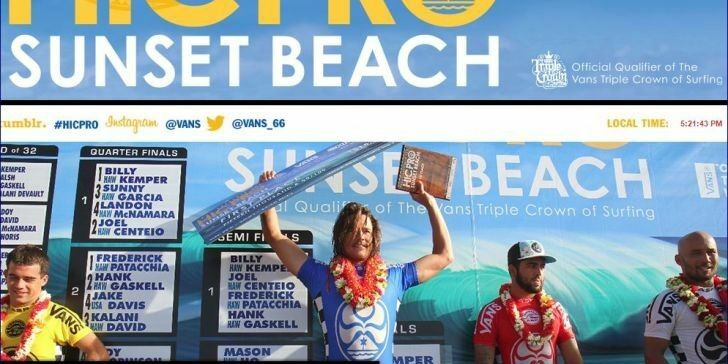 It was an emotional win on many levels: surfing with a Final full of close friends from Hawaii; winning at home after so many years; and qualifying for the Vans Triple Crown. But this year has been particularly tough for Fuller. His mother was diagnosed with cancer early this year and he withdrew from much competition to tend to family. To dedicate the win to his mother, his wife and young daughter today was a bright moment. “My mom has sacrificed so much for me along the way, so to dedicate this win to her means so much,” Fuller said. Up against three former HIC PRO champions in the final – Fred Patacchia, Mason Ho and Billy Kemper – Danny surfed five rounds today en-route to victory and had a feeling this might just be the day. “This moment feels surreal, but I feel like I’ve earned it. I finally realized that if I can surf at my best performance, I can be as good as anybody. “I’ve made finals at Pipeline and here before, but there’s only once I was in all three events of the Triple Crown and unfortunately I suffered a back injury right before it. It’s Hawaii. Dreams are made and broken. I’ve just got to keep it positive and do my best. “The ocean has been the giver of everything to me in my life and I’m so grateful for that.” In addition to surfing, Fuller is also an established ocean photographer with collections in galleries in New York and Los Angeles. As the official qualifier for the Vans Triple Crown of Surfing, the HIC PRO and the impact of its results on the ASP Hawaii Regional ratings determined 11 final entrants into the upcoming REEF Hawaiian Pro – stage 1 of the three-event series. They are: Fuller; Kemper; Joel Centeio; Pancho Sullivan; Jamie O’Brien; Reef McIntosh; Landon McNamara; Ian Walsh; Imaikalani Devault; and ASP Junior brothers Seth and Isaiah Moniz.